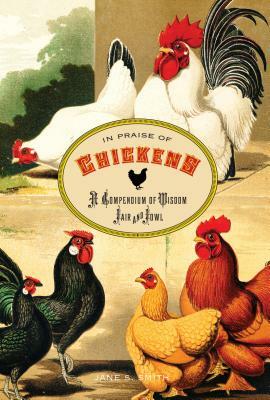 What follows is a compact miscellany of chicken wisdom--a lively and amusing collection of quotations from past authorities on all things chicken, interspersed with brief editorial comments and complemented by wonderful illustrations. Whether a single sentence or several paragraphs, selections are all little known and long on charm. In Praise of Chickens can be savored in small pieces or enjoyably devoured all at once. It includes a demonstration of how to hypnotize a chicken; an account of a chicken rodeo; Mark Twain's sly tips on raising chickens; and a dictionary of the twenty-three-word vocabulary of the domestic chicken. Jane S. Smith writes about the intersection of science, nature, taste, and popular culture. She received her Ph. D. in English from Yale University and has taught at Northwestern University in fields ranging from literature to preventive medicine. Her history of the first polio vaccine, Patenting the Sun: Polio and the Salk Vaccine (William Morrow), received the Los Angeles Times Book Prize for Science and Technology and was nominated for the Pulitzer Prize. Elsie de Wolfe: A Life in the High Style (Atheneum) remains the definitive biography of the woman who transformed taste from an attitude into an industry. Her comic novel Fool's Gold (Zoland) won the Adult Fiction Award from the Society of Midland Authors. Her most recent book, The Garden of Invention: Luther Burbank and the Business of Breeding Plants (Penguin Press 2009), was awarded the Caroline Bancroft Prize in Western History. She and her husband live in Chicago, where she works in a very small room with a very large window.